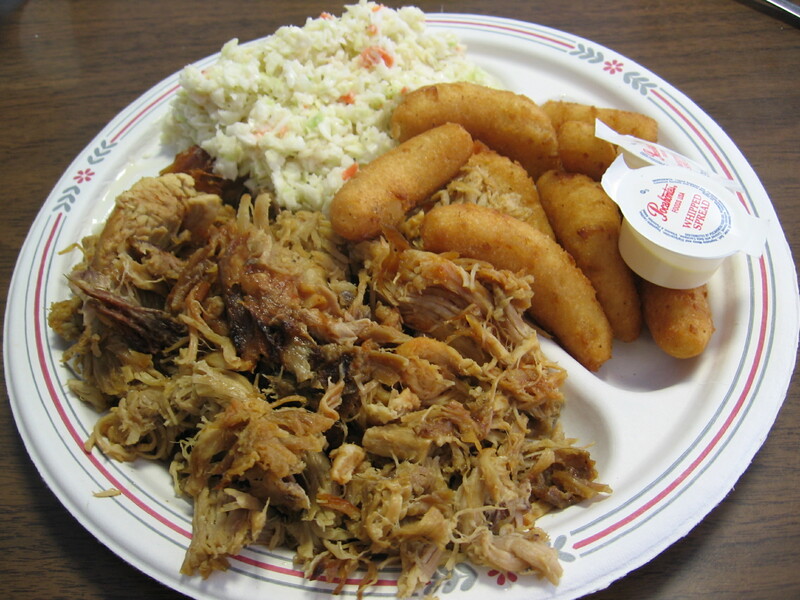 It is with considerable sadness that I report the recent closing of the venerable Blue Mist Bar-B-Q, which I would hazard a guess was one of North Carolina’s most visited and loved barbecue joints over the years. Blue Mist was established in 1948 and for as long as I can remember occupied a modest piece of real estate on the eastern edge of Asheboro, just off of Highway 64, which for many years was (along with Hwy 70) one of two key east-west highways in the state. Highway 64 stretches from the far western corner of the state to the Outer Banks, following a meandering path through much of the state’s tobacco, textile, furniture and BBQ belts. Blue Mist was my family’s go to spot on trips to the North Carolina Zoo, and it was on a trip to the zoo this past weekend that I discovered it had closed. At least for now, the small white pig statue still stands sentinel the front door, but he is looking a little more nervous than usual, perhaps wondering if he will soon join his Zoo-dwelling friends in a cage. According to Asheboro’s Courier-Tribune, Blue Mist closed its doors for the last time on July 7th due to no more exotic reason than a decline in customers. (Read the article here.) Blue Mist was not among the best BBQ joints in the state but it was plenty good and had maintained its traditional wood-fired cooking methods, which put it in increasingly elite company over the years. If we are to believe that all good things must come to an end, then we can be happy that Blue Mist was good for as long as it was. Still, it will be missed. My last plate at Blue Mist, as it turned out. That is indeed sad news. Terri and I have stopped by the Blue Mist many times driving home from visiting kin and always found it a great place to dine. Oy veh! Another one bites the dust. There are so many _bad_ barbecue restaurants that could have closed instead, why did it have to be one of the handful still doing it right? I never could understand why the Blue Mist wasn’t on Jim Early’s Historic Barbecue Trail. Maybe someone should start a trail connecting the sites of great places that are gone. For the Ghost Trail: Turnage’s and Dillard’s in Durham alone. Huey’s in Burlington. Ed Mitchell’s in Wilson. Guy Parker’s in Raleigh. Just for starters. And what about places still in business, but now just serving roast pork that they _call_ “barbecue”? Naw, too many of those. My Brother-in-law and my sister ran the place. Into the ground. Poor quality, you can check Yelp reviews is actually what killed the place.Not the bypass. Too much, wide menu, forced the place to close. Nothing to come back for, they lost focus, except for the money, lol. Just bad management and bad decisions about business led to the downfall, and i was well-deserved. When the money left, they bailed, like Sarah Palin.